Sixty years before his nephew set out to rid the world of the One True Ring, Bilbo Baggins (Martin Freeman) was enlisted as a ‘burglar’ to help the dwarves win back their rightful home from the evil dragon Smaug (Benedict Cumberbatch). The first leg of their journey tells the story of goblins, trolls, hobbits and a mysterious creature known as Gollum (Andy Serkis). Cast wise, everyone is back, plus there are a few new faces. Of the old we have Ian McKellen, Cate Blanchett, Elijah Wood and others. McKellen is still enjoying himself, and is fantastic with the gruff but sage one liners, Blanchett is ethereal and floaty as ever and Elijah Wood turns up momentarily, throwing the timeline of The Hobbit vs The Lord of the Rings Trilogy into question… But more on that later. As well as these three, Bret McKenzie has a slightly larger role in The Hobbit than he did in the previous films, which is great to see, and Andy Serkis resumes his scene stealing performance as Gollum. The new faces are many, and a lot of them are ones that audiences will recognise from TV; Martin Freeman (The Office, Sherlock) as Bilbo Baggins the younger, Aidan Turner (Being Human) as Kili, Dean O’Gorman (The Almighty Johnsons) as Fili Sylvester McCoy (Doctor Who) as Radagast, and the hint of Benedict Cumberbatch (Sherlock, Parade’s End) as the voice of Smaug. To discuss these performances individually would take a lot of time, and would not serve any great purpose, as this is a film that is mostly carried by the strong ensemble rather than the individuals. The story, since it has been broken down into three parts, sometimes feels as though it has been stretched thin. 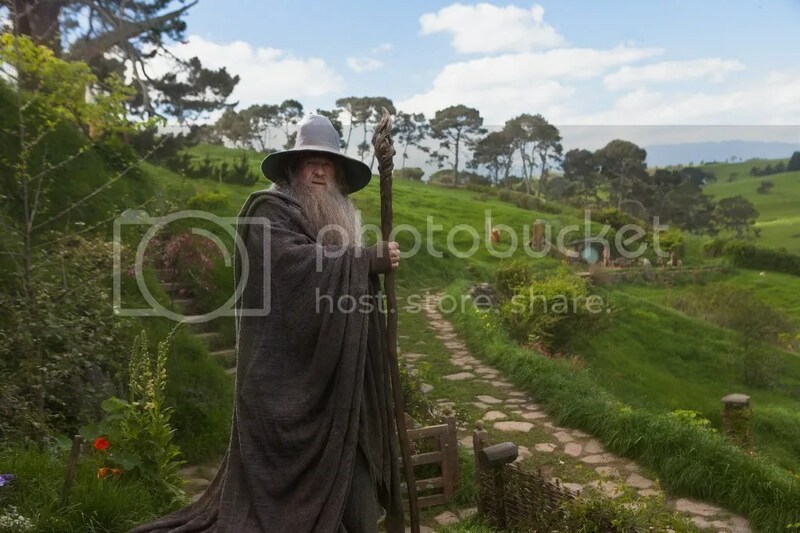 While Middle Earth is a beautiful world full of stories and mysteries and it is lovely to return and spend time there, there are many scenes throughout the film that should have been trimmed for the sake of pace. As well as this, there are far more reaction shots than necessary, each one taking up precious seconds. At 174 minutes, The Hobbit: An Unexpected Journey is not a brief film, but it could easily have had 40 minutes or so shaved off, which would have benefitted the pacing. There is something oddly familiar about The Hobbit: An Unexpected Journey, and it is not that fact that we are returning to a world that we already know, it is due to the story arc of the film being oddly similar to that of The Fellowship of the Ring. If the story had not been split, this may not have been as obvious, but as it stands this comparison is hard to avoid. Oh and the ending is a true deus ex machina moment that may be taken from the book, but it feels a little too convenient here. The issue of production order also rears its head. We know that Tolkien wrote The Hobbit first and followed it with the much darker Lord of the Rings trilogy, since his audience had grown up in the 20 years between the stories. Obviously the films have been done the other way around, which may leave audiences who grew up with The Lord of the Rings trilogy wondering why they were watching a follow up aimed at kids. Making the films in this order also raises the question of when The Hobbit is set; Frodo is still in The Shire, so does the elder Bilbo still have the Ring? This is not a question that is incredibly important, but since it is not answered, it may leave audiences wondering about timelines – and there are about three going on here – and not the story of the film. Maybe I am nitpicking. Feel free to tell me so in the comments. Moving on… And so, on to the 48 frames per second debate. It is a great idea, in theory, to try and reduce flicker and blur in a film, but the result is an image that looks far too much like cheap TV. The result of this, then, is that the audience is constantly jarred out of the film, suspension of disbelief is shattered and the images look speeded up in the vein of Benny Hill. Oh and the film kept going out of focus, which was incredibly distracting. All of that aside, however, there are some great things about The Hobbit: An Unexpected Journey. As mentioned, Martin Freeman is fantastic as Bilbo Baggins and his interactions with every character are a joy to watch; Freeman as Bilbo forms the emotional heart of the film as the fish out of water who was roped into an adventure, and found himself in several battles. As well as this, Andy Serkis steals the show as Gollum, and the scene where he and Bilbo tell one another riddles is perhaps the best in the film. The CGI is better than ever – although for some reason the trolls look horribly fake – and the world of Middle Earth is still as beautiful as we remember it. The story may be absent in parts, but it is fun to try and connect the dots between this and the films we have already seen. I can’t say that I noticed the film going out of focus, but perhaps I was too engrossed to pay attention to such little details. As for the timeline issue, I thought it was pretty clearly laid out that the scenes with old Bilbo and Frodo were set right before the LOTR trilogy, and then it flashed back to young Bilbo as he writes the book for the main bulk of the movie.